The process of making low-fat milk also strips away nutrients. So the nutrition is scant, and the sugar level is high. 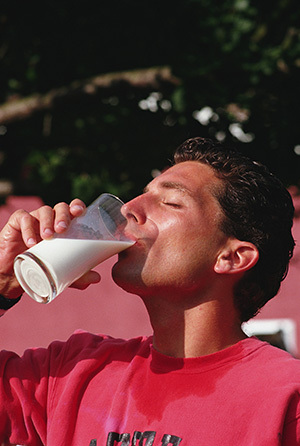 Harvard researcher David Ludwig, M.D., Ph.D., analyzed a recommendation from the USDA and the American Academy of Pediatrics to drink three cups of reduced-fat milk per day. He concluded that it is very bad advice. But very little research has actually been done to determine whether or not low-fat milk helps with weight loss. In fact, a rapidly growing mountain of research reveals that reduced-fat foods contribute to weight gain because they do not make us feel full. Reduced-fat foods have what researchers call a lower satiety value and that causes us to want to eat more to feel full. Many schools offer sugar-sweetened milk to achieve the recommended levels of total milk consumption in children. One cup of 2-percent milk contains more sugar that a Reese’s® Peanut Butter Cup. The process of skimming away the fat in milk has the negative effect of speeding up the body’s absorption of sugar. The process of making low-fat milk also strips away nutrients. So the nutrition is scant, and the sugar level is high. Despite the clever ads featuring celebrity milk mustaches, drinking low-fat milk every day, especially the sugar-added kind, promotes obesity and type 2 diabetes. Sources: Ludwig DS, Willett WC. “Three Daily Servings of Reduced-Fat Milk: An Evidence-based Recommendation?” JAMA Pediatr. 2013:1-2.